The Crescent Beach section of North Myrtle Beach is home to the luxurious, yet family-friendly San-A-Bel Resort. Crescent Beach is a popular spot for residents and vacationers who are looking for a quiet respite from the hustle and bustle of Myrtle Beach, yet still long to be close to the seemingly endless array of fun and excitement. Read more about San a Bel real estate. Although it enjoys a lovely, almost-secluded location, Crescent Beach is located near the fantastic dining options of Restaurant Row, the great shopping and dining of Barefoot Landing, and of course, over 120 local championship golf courses. 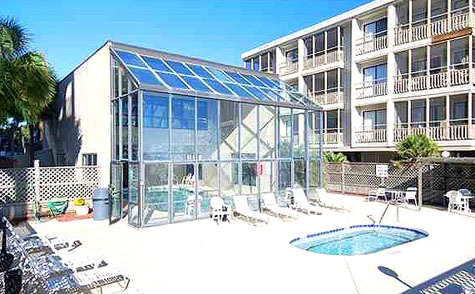 This all-suite North Myrtle Beach condo was built in 1987 and features 96 units with open floor plans and plenty of living space. The spectacular, oceanfront location makes this resort a truly luxurious, seaside getaway. 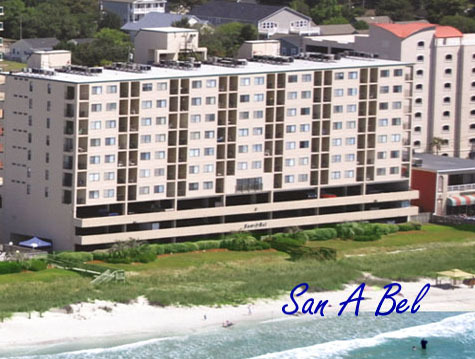 The beautifully decorated interiors of San-A-Bel Resort offer expansive, oceanfront balconies from which to enjoy the sweeping views of the Atlantic Ocean and the spectacular Grand Strand. Other features of the two-bedroom, two-bathroom condominium suites, which comfortably accommodate six people, include full-sized kitchens, washer/dryer connections, air conditioning, and mini-bars. Plenty of resort amenities at San-A-Bel Mytle Beach condo ensure that every member of the family is satisfied and entertained. The glass-enclosed, indoor swimming pool, which is heated during the winter months, offers fantastic views of the beach, while the nearby fitness center, also enclosed in glass, allows you to get your morning workout in while watching the bikinis and the sea gulls. The expansive, oceanfront sundeck provides a picturesque backdrop to the resort’s relaxing whirlpool tub, and provides direct access to a beautiful stretch of Myrtle Beach on which you can play in the surf or simply sit back and enjoy the warm, South Carolina sun. Other resort amenities include children and teen activities and programs, free on-site parking, an outside grill area and a meeting room. If you are looking for a more private vacation or permanent home, be sure and look at these condos.